Oasap International Giveaway - Two Winners! | The Shopaholic Diaries - Indian Fashion, Shopping and Lifestyle Blog ! As November ends, I have brought a new Giveaway for you sponsored by Oasap.com. Giveaway starts from today ie. 30th November and will end on 7th December, 2013. 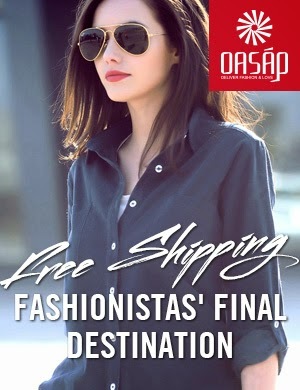 Two winners will be chosen from the participants who have commented their emails and also pinterest links of their favorite apparels pinned on http://www.pinterest.com/OasapOfficial/. One winner will receive $50 coupons and the second winner will get $30 coupons for purchasing any wish items on www.oasap.com. So enter now! Good luck to everyone!! I'm already a follower every link that you shared. Cagla or Cagla Tasdemir the name I used. I really want this. I am doing this for my girlfriend.